The No.7-seeded Ohio State baseball team defeated No. 3-seeded Michigan, 5-3, on Friday at TD Ameritrade Park in Omaha, Neb. The Buckeyes tallied nine hits compared to 10 for the Wolverines. Ohio State’s first three hitters in the lineup helped carry the team to victory. Dominic Canzone hit 2 for 3 with two walks and two runs scored. Kobie Foppe hit 2 for 5 with one run scored and one run batted in. Tyler Cowles hit 1 for 3 with a walk and two RBI. 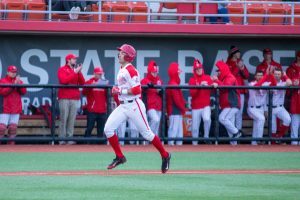 Canzone had a big day, reaching base in four of his five plate appearances despite being hobbled by a thigh contusion suffered in OSU’s 8-2 loss to Purdue on Wednesday. Michigan threatened to score early, but Ohio State starter Adam Niemeyer escaped the first inning with a runner on second base and one out and the second inning with runners on first and second and one out. The Buckeyes got on the board in the top of the third inning when Cowles roped a double to left field, scoring Canzone. On the next pitch, Noah McGowan extended the Ohio State lead to 2-0 on an RBI single that scored Foppe. Michigan right hander Jack Weisenburger relieved starter Ben Dragani in the fourth inning after the freshman southpaw allowed a double to Dillon Dingler and walked Canzone following a wild pitch. Weisenburger struck out Foppe to end the inning. Dragani allowed two runs on five hits and two walks with one strikeout in 3⅔ innings. Harrison Salter led off the fifth with a double for the Maize and Blue, and Dominic Clementi followed with a single. Jonathan Engelmann hit a sacrifice fly to center field, scoring Salter and cutting the lead to 2-1. The Wolverines’ run was the first allowed by Ohio State since the sixth inning against Purdue, ending a streak of 15 consecutive scoreless frames for the Buckeyes’ pitching staff. Niemeyer was relieved by right hander Austin Woodby to open the sixth inning. The starter from Minster, Ohio, struck out four and allowed one run on five hits, one walk and one hit batter in five innings. Woodby stranded Blake Nelson at third, who had doubled and reached third on a groundout. Bo Coolen led off the bottom of the sixth with a solo home run beyond the fence in right field. Dingler flied out, and Michigan right hander Jayce Vancena relieved Weisenburger. The Millbury, Ohio, native walked Noah West, gave up a single to Canzone and allowed Foppe to drive in West on a single to center. Michigan left hander Angelo Smith came in for Vancena, and Cowles hit a sacrifice fly to right field, scoring Canzone and extending the Buckeyes’ lead to 5-1. The RBI by the senior from Grove City, Ohio, was his fifth in the tournament and Ohio State’s ninth as a team. The Wolverines answered in the top of the seventh with a two-out rally. Jesse Franklin hit a two-out double to right field, advancing Clementi to third. Brock Keener came through with a two-run single up the middle, cutting Ohio State’s lead to 5-3. Ohio State right hander Seth Kinker relieved Woodby in the eighth after a strikeout and a walk. Woodby allowed two runs on four hits and one walk with two strikeouts in 2⅓ innings. Kinker struck out a pair of Wolverines to end the inning. Kinker allowed a one-out double to Engelmann in the ninth, but shut the door on Michigan for save No. 15 on the season. The Huntington, W.Va., native struck out four of the six batters he faced, allowing just one hit in 1⅔ innings. In his postgame interview, Canzone was candid about how it felt to beat a rival like Michigan at this point in the season. Canzone was asked about how he felt about Ohio State’s chances moving forward in the tournament, as the Buckeyes will play No. 1-seeded Minnesota at 10 a.m. ET on Saturday. If the Scarlet and Gray win, the teams will play again at 6 p.m. for an opportunity to advance to the Big Ten Championship at 2 p.m. on Sunday against the winner of Purdue and Illinois.